If you ever get around to digitizing those old 35 mm slides in your basement, you may notice that they could use some cleaning. 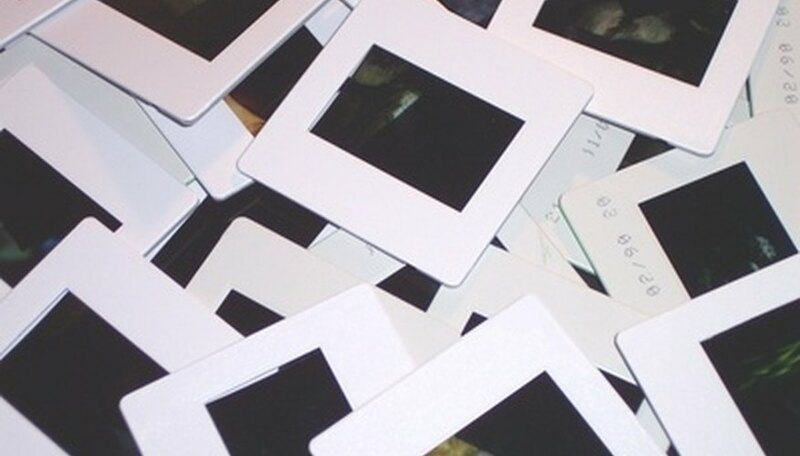 Once 35 mm slides were one of the most common ways to store many pictures at a time, and most people didn't think to take extra care in storing them. As a result (even in a closed box), 35 mm slides are subject to dust, debris and sometimes even mold. Although modern digital scanners come equipped with detailed features to help you remove blemishes from the digital versions of your slides, it's still best to clean them beforehand to allow for both better viewing and future preservation. There are ways to clean 35 mm slides at home, but it's important to remember that if your slides are particularly irreplaceable or old, it may be best to take them for professional cleaning to ensure they don't get damaged through your good intentions. To dislodge loose dust and debris, spray the slide with compressed photographic gas, such as Dust-Off. Make sure the brand you use specifically states that it is safe for use on negatives. Use a soft, lint-free cloth to gently wipe the surface of the slide. Don't scrub or use force, as microscopic residue could irreparably scratch the surface. Obtain a cleaner that is specifically made for film. Moisten a lint-free cotton cloth with it and rub it gently across the surface of the film. Allow it to air dry and again use the compressed gas to get rid of any fibers that may have accumulated. If you don't have access to a commercial film cleaner, you can use petroleum ether, such as naptha, or pure alcohol as a substitute. If you're ever in doubt as to the advisability of cleaning a particularly old or damaged slide, err on the side of caution and take it to your local camera shop for a consultation. At the very least, make a precleaning digital copy of the slide in case it becomes irreparably damaged. Compressed photographic gas and film cleaner can both be found at your local camera store or camera repair shop. It's always a good idea to test out any cleaning options on a slide that you wouldn't be sorry to lose before trusting them on the irreplaceable ones. Many people find that clean T-shirt material or cloth baby diapers are effective, inexpensive substitutes for a commercially produced lint-free cloth. Never use a water-based cleaner on your slides as it will emulsify the dye and erase your picture. Don't use rubbing alcohol as a cleaner because it may contain water. Only pure alcohol will not damage the film.